115mm is the most popular range of Cast Iron Ogee and comes in a beautiful pre-painted black finish. 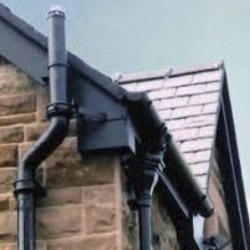 The Ogee profile, seen below, is reminiscent of Victorian guttering styles, giving any building a traditional feel. 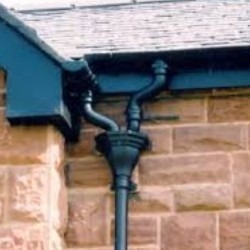 The 115mm option can connect to either 65mm or 75mm Round Downpipes. As the Ogee profile is asymmetrical, all sockets are found on the left side of each fitting, if facing the gutter head on. 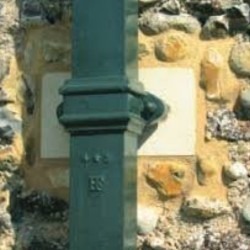 For this reason stopends and stopend outlets are either left or right handed, and corners are either external or internal depending on which path the guttering needs to take. Viewing the pictures should make it apparent which fitting is suitable for your job, although if you do need help please do not hesitate to contact us. The 115mm Ogee guttering system has an internal width of exactly 115mm, and a depth of 60mm, making it slightly shallower than the Notts Ogee system. The guttering comes in 1.83m (1829mm) lengths which equates to the old 6ft imperial measurement.